05:44 Daniel tells the story about finding a Salvia plant at a Terence McKenna lecture. 12:06 He describes the traditional Mazatec way of taking Salvia divinorum. 24:39 Daniel talks about the various categories of experiences that are possible through the use of Salvia Divinorum. 28:49 Daniel talks about his isolation of the active ingredient in Salvia Divinorum. 43:18 Daniel talks about the varying amounts of time a Salvia experience can last depending upon dosage and method of use. 50:40 A discussion about the current legal status of Salvia. 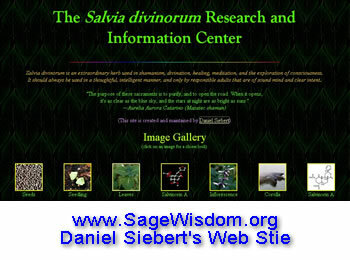 Posted in Consciousness, Daniel Siebert, Salvia divinorum, Shamanism and tagged Consciousness, Daniel Siebert, Salvia divinorum, Shamanism, War on Drugs. great website and really helpful for find info on Kratom. BLAH, okay so I got a “Salvia” plant… umm humm… you are suppose to eat even numbers of the leaves (I think it was 24 or so)…. OMG! I ate one and it was NASTY. Bitter nasty *gag… I have no idea how anyone could eat a bunch of that nasty vile weed! OH YEAH and nothing happened, I don’t know if eating a bunch of leave REALLY would be worth whatever you’d get compared to how nasty it taste. Why would anyone go for this weed over the nice “herb”…. I don’t suggest it kids.